Apologies to everyone for such a late post. I’ve not really been up to getting a post on here due to being pretty damn ill for the best part of last week. I’ve also been in the throes of moving house (and still am). That said, this is going to be quite a hefty post and an update on my process. 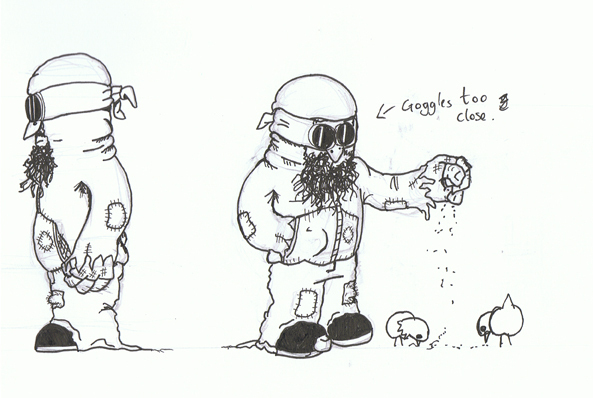 These are another few sketches following up the first Pigeon King drawing. Aside from the annotations in the image, there’s a big problem with the character. The theme isn’t really working, and he doesn’t have a very strong visual identity. 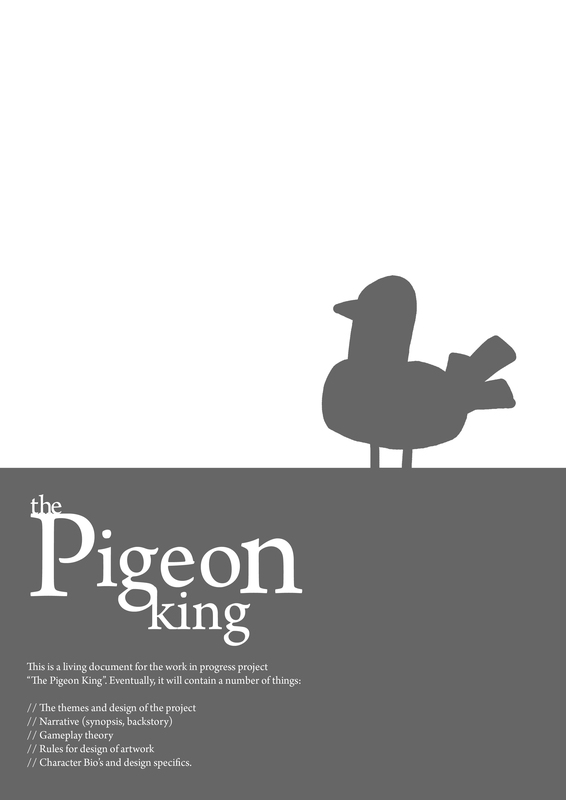 After spending some time on wikipedia exploring the subject of pigeon keeping I was suprised to learn that mankind has been “taming ” pigeons for over 10,000 years. That’s quite the heritage. Specifics of that person aside. It got me thinking about how pigeons have this british association, london, trafalgar square – they all seem to add up. So as I was thinking of Britian, the typical images of very british things come into my head, tweed jackets, flat caps, mary poppins, etc – and I realised a lot of them share a common theme of beiong “Victorianesque”. It’s not the best trail of thought, and one that doesn’t sound eloquant at all on paper, but non the less, that’s how I got to the above drawing. 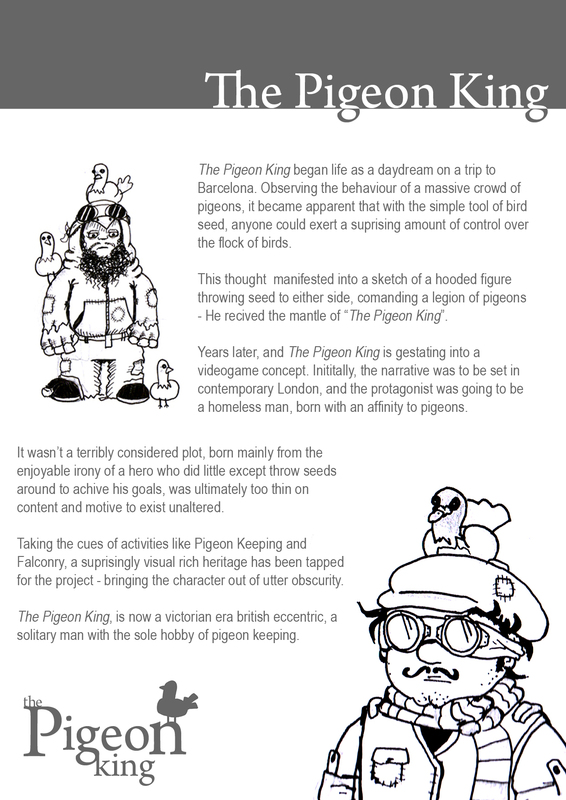 In this rendition, the pigeon king is a victorian british eccentric. 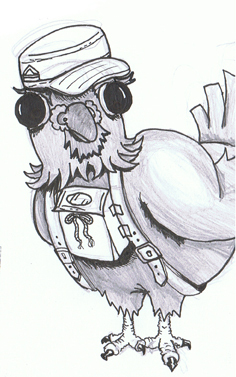 You can see that he is wearing a falconry glove and that he has retained the flight goggles. 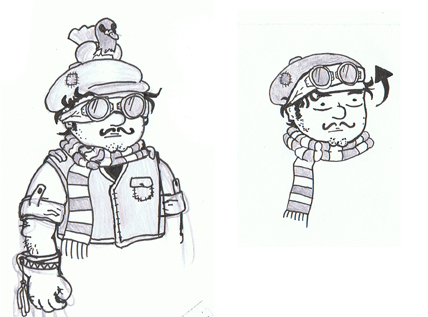 He also, I think, has a much stronger visual identity. 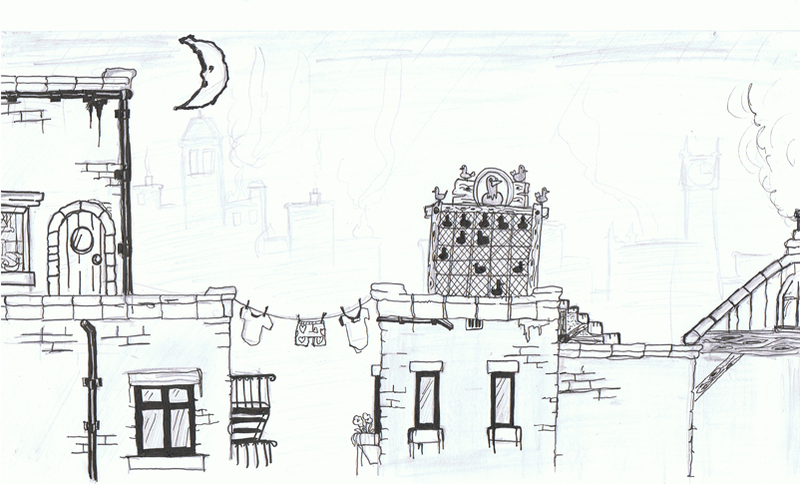 This is a sketch of how a level in the game may look. 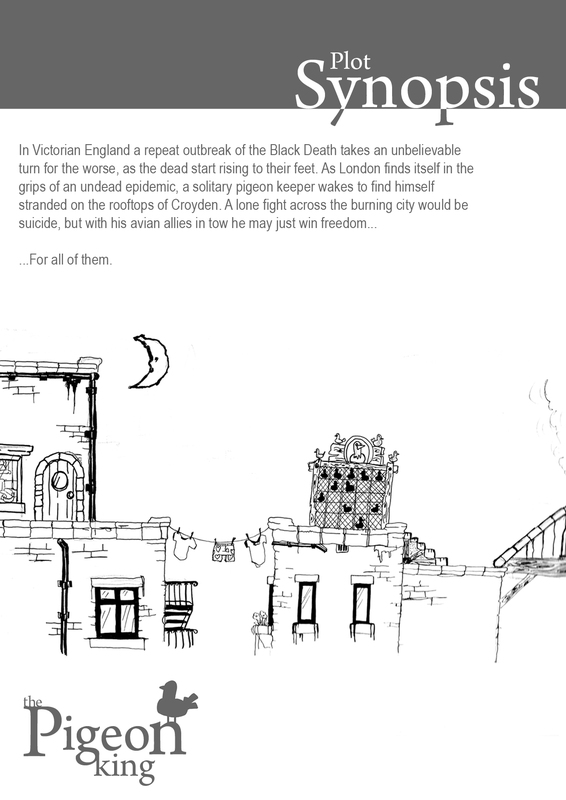 Victorian roof tops is what I was aiming for, however without further study of the architecture from the time, I wont be able to nail the look and feel. After a tutorial last week, it became apparent that perhaps the character work couldn’t really begin properly until the world around him had been established. Things like the falconry glove are a good indicator of the strength of knowing your characters purpose, if I want more discoveries like this in my designs then I should perhaps establish at least some sort of narrative surrounding them. To write the synopsis, i originally wrote it myself, then drafted in the help of a creative writing student from Derby, to tighten up the prose, and give it a bit more punch. The synopsis of the plot is there to realise the motives of the characters a little more. At a later stage I will create a full narrative, that details the full plot. 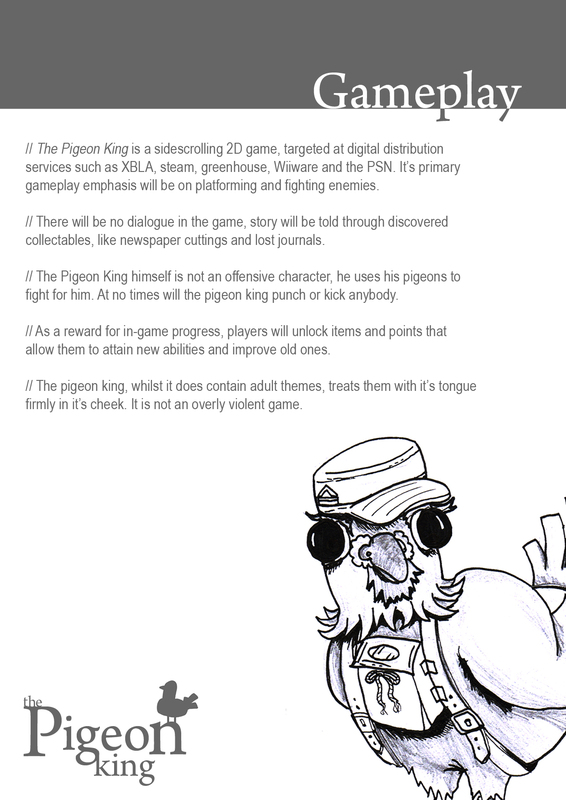 Gameplay details are included for the purpose of realising the limitations of the characters and the medium, which is important in maintaining my platform sensitive methodology. I feel a lot more confident about creating a body of work surrounding this narrative now, and actually very excited about further expanding the story and gameplay mechanics over the coming weeks.